The human shoulder, a wonderful yet delicate joint is vulnerable to injuries. Generally, shoulder injuries occur from athletic activities that involve repetitive, overhead motions in sports like cricket, tennis, baseball, swimming and weight lifting. A Shoulder rehab program aims at strengthening weak muscles, restoring scapular motion and fixing posture problems to ensure that you return back to your game with renewed energy and gusto. A well-thought-out Shoulder rehab program aims at restoring full function to the shoulder using exercises specifically for an injury or surgery to the shoulder. Thiscomprises of stretching, strengthening and balance exercises. 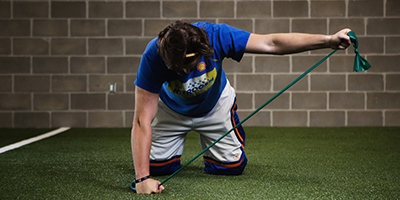 Initially, these exercises must be done gently and safely to avoid reinjuring the shoulder or making the injury worse. Progressing through the rehab program helps ensure the most effective recovery and increases your chances of returning to full function. In order to perform the exercises correctly and build strength gradually, your doctor may recommend that you see a physical therapist to guide you through the rehabilitation process. Aggressive rehabilitative approach can be harmful, such as aggressive stretching or massage and when dealing with a shoulder that has very low range of motion, there is risk of damage to the weak muscles and tendons. To ensure that the Shoulder rehab program is safe and effective for you, it should be performed under your doctor's supervision. It is important that you talk to your doctor or physical therapist about which exercises will best help you meet your rehabilitation goals. A careful, well-planned rehabilitation program is critical to the success of a shoulder injury or surgery. Your return to normalcy depends a lot on your commitment to follow the exercise program developed by your therapists. If you have sustained a shoulder injury or undergone a shoulder surgery opt for anevidence based Shoulder rehab program. With a little patience and consistency a full recovery may be possible. Keep in mind that success in healing and regaining full use of your shoulder depends largely on your self-discipline and willingness to stick to the program.